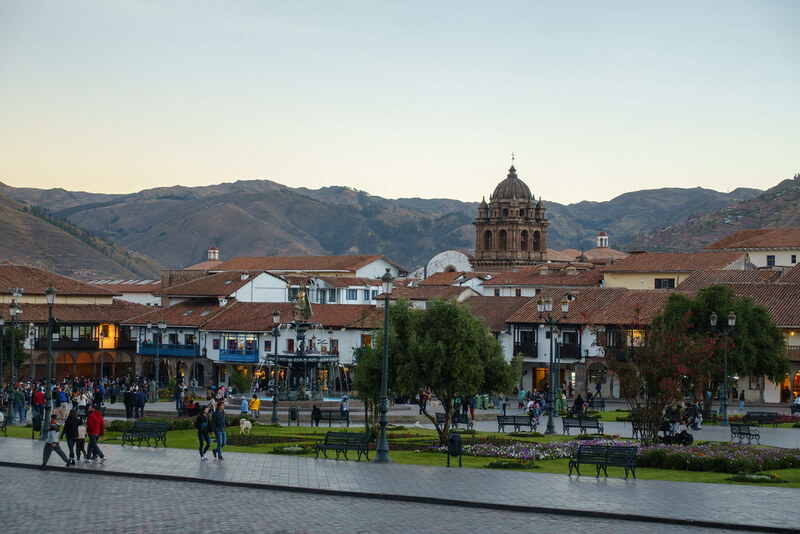 Post 5 of a series detailing our trip around South America. View the series so far here. 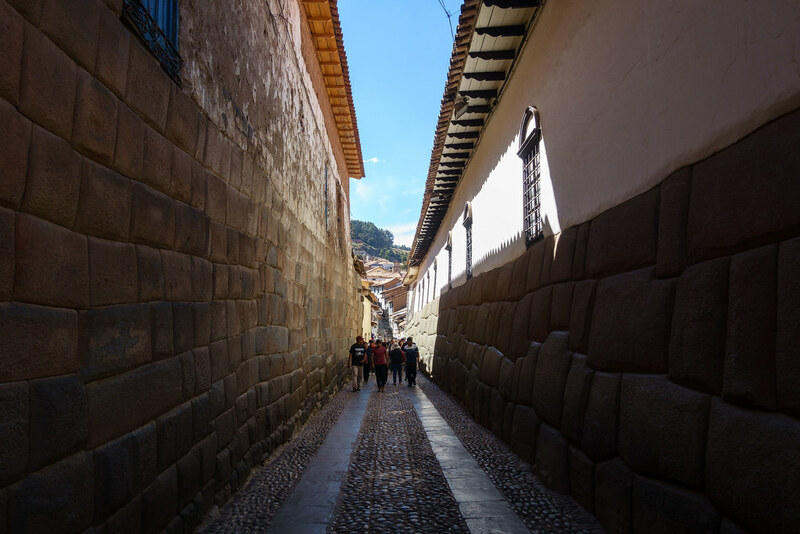 For us Cusco was more of a pit-stop than a destination in itself. 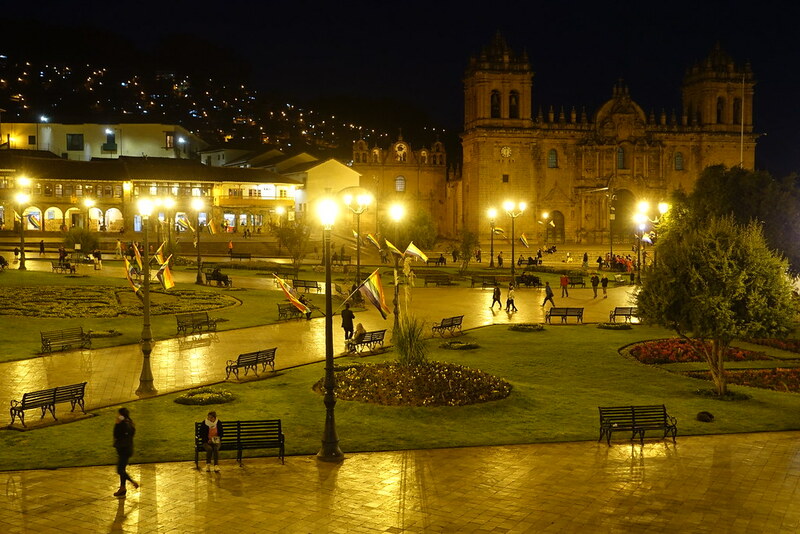 We had an evening there before Machu Picchu, and a night and almost a full day before catching the sleeper bus to Bolivia. 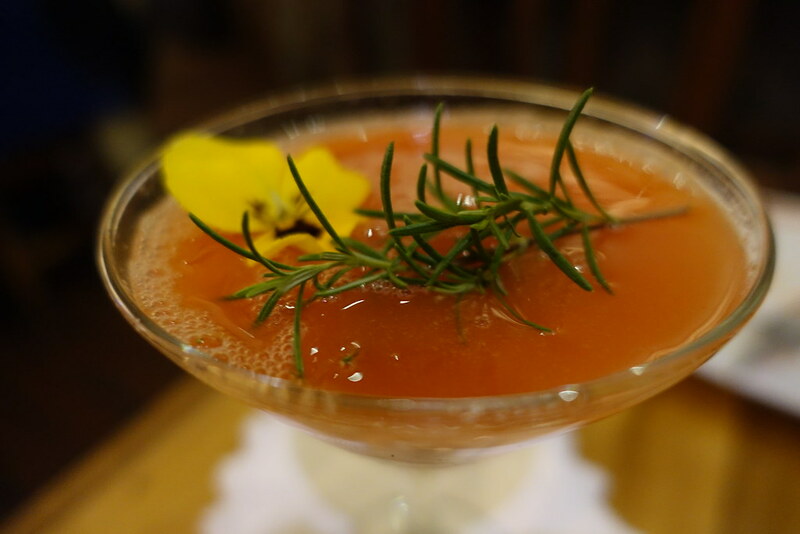 As we weren’t particularly interested in visiting any museums or galleries, we spent the time doing what we know best: exploring, eating, and drinking! 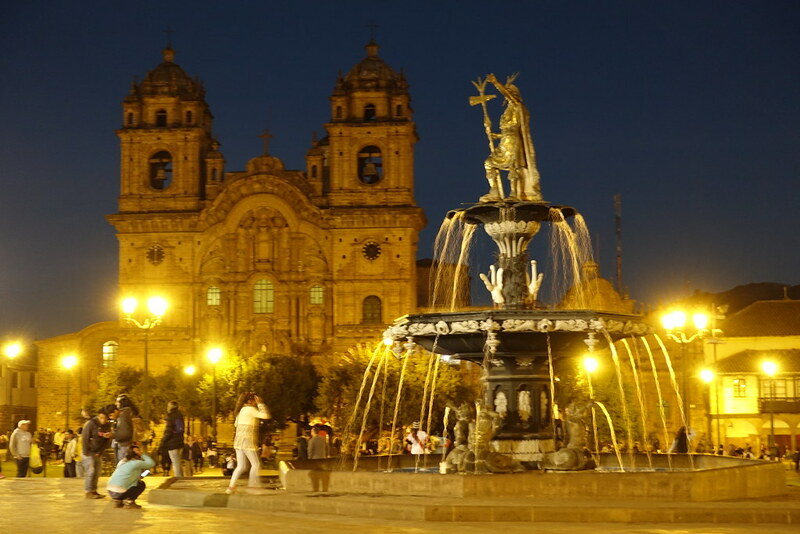 Flying into Cusco, we were really nervous about potentially suffering altitude sickness after landing. A traveller we’d met beforehand had told us how she’d been so sick that she couldn’t even get out of bed. As the plane touched down, I braced myself for an oncoming wave of nausea and pain. It never came. As I stepped off the plane I felt a tiny bit different – it seemed to take a little more effort to walk and breathe, and the ache in my legs from yesterday’s rainforest hike seemed rather amplified. But as the first day went by neither of us developed any sickness or serious headaches, even as we progressively tested our constitutions with food and alcohol. We felt incredibly relieved! I was nervous about getting a taxi from the airport due to the aggressive selling tactics of the drivers. But it was ok in the end, and when we got to our hotel Torre Dorada it felt like a safe haven. Stepping in the door we were met by receptionist Veronica, who told us a bit about Cusco and the hotel’s pick up service. Our room was lovely too. 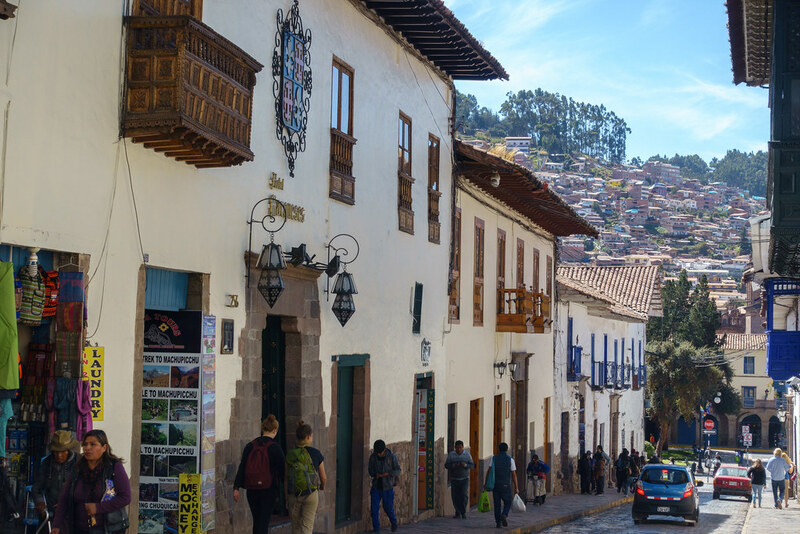 Having settled in, we went to the hotel dining room for a light lunch of taquenas (cheese wrapped in filo pastry and deep-fried, typically served with guacamole) and vegetable kebabs with herby potatoes. After a bit more rest and some coca tea (which I thought tasted like standard green tea) we were ready to venture outside. 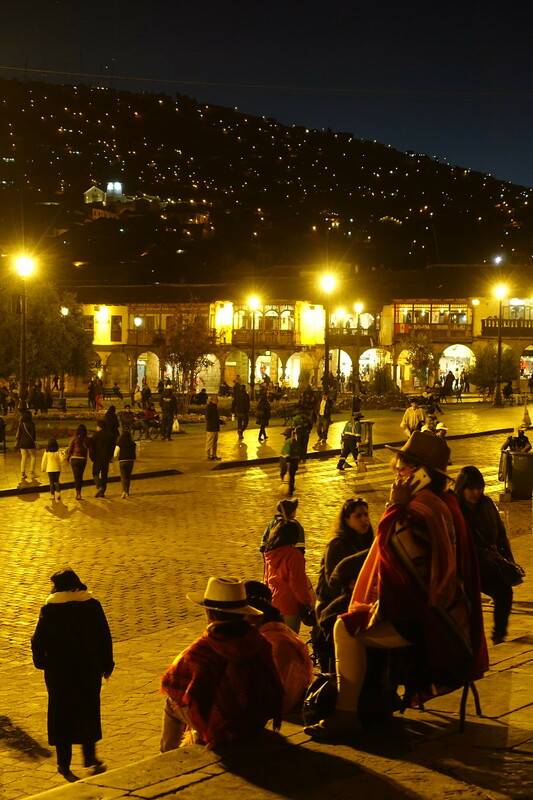 We walked down Avenue El Sol to Cusco’s central square, Plaza de Armas. The green gardens, terracotta roofs and long avenues of arches, all set against a mountainous backdrop, makes it a beautiful scene. So it’s a great shame that it’s impossible to get a quiet moment here. I was dismayed by how much we were harassed, mostly by people trying to sell us artwork, a massage, or a meal at their restaurant. One man even chased us down the street, just to show us his menu! I hardly felt able to stop and take a photo. 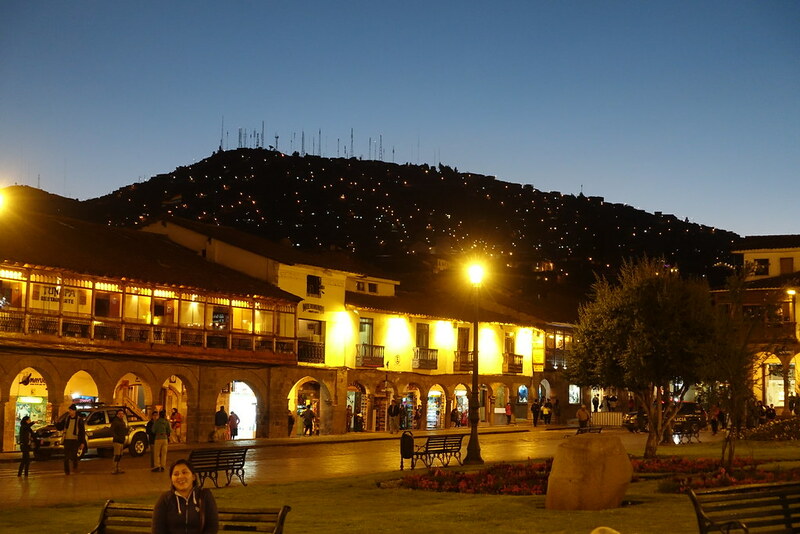 Nevertheless, we continued to explore the Centro Historico, withdrew some money from the free-to-use cash machines in the BCP bank, and took some photos of the buildings prettily glowing and twinkling at twilight. We’d decided that tonight we wanted to try Peru’s national dish, ceviche. For the uninitiated, ceviche is chunks of fresh raw fish cured with citrus juice. 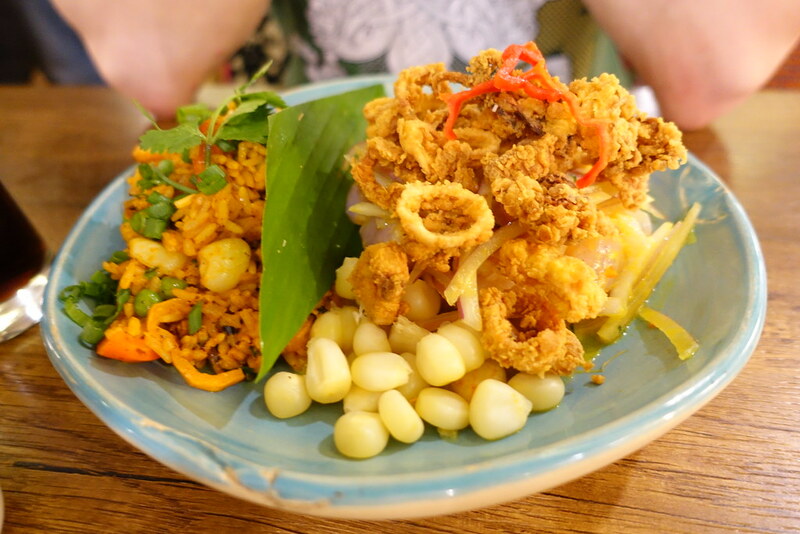 Having compared the menus of several restaurants, we decided to eat at one called Morena – primarily because there was no-one stood outside trying to make us go in there! It was one of the pricier options, but I felt that made it a safer place for our first try of ceviche. 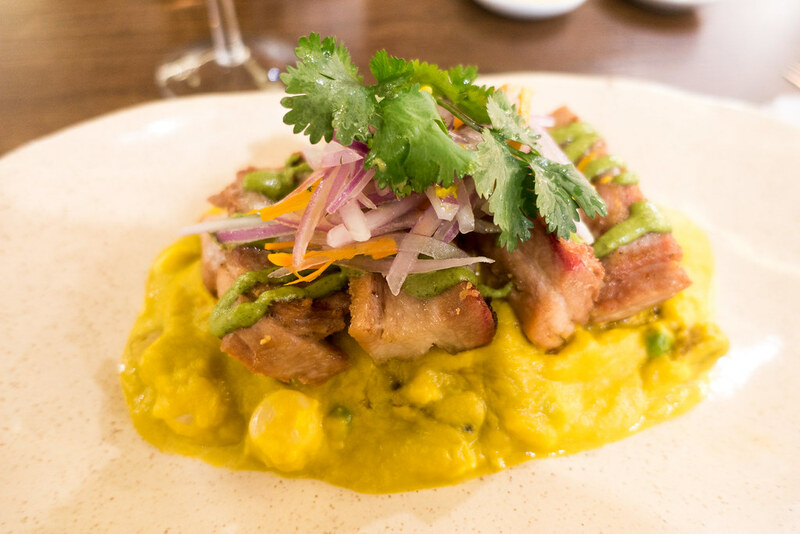 I had a lovely white wine that was a blend of several varieties, and a main course of slow-cooked pork belly on a pumpkin and cheese risotto with yellow chilli sauce. Steve had a combination of ceviche topped with calamari, and seafood rice. Both were delicious; we only wished we had enough room to finish everything! We used the ancient mobile phone we’d borrowed from Torre Dorada to call the hotel and ask to be picked up and taken back. The following day we went to Machu Picchu. 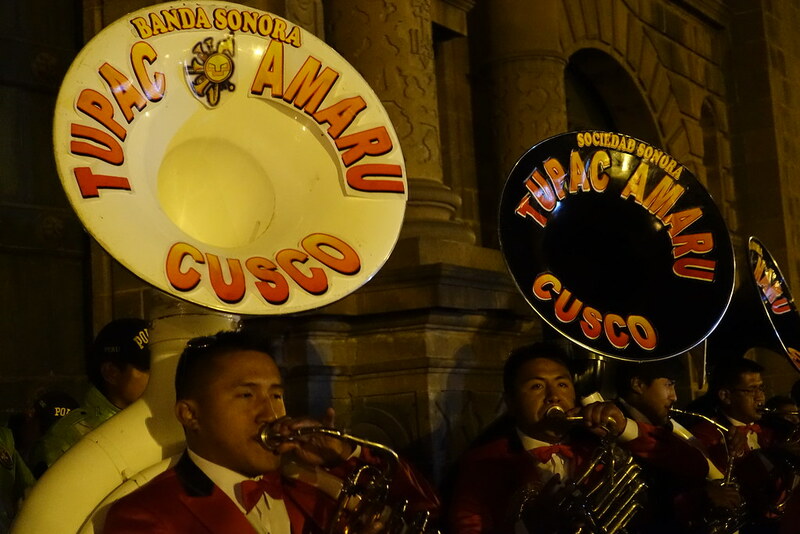 The day we returned to Cusco just happened to coincide with Corpus Christi, a huge religious festival. 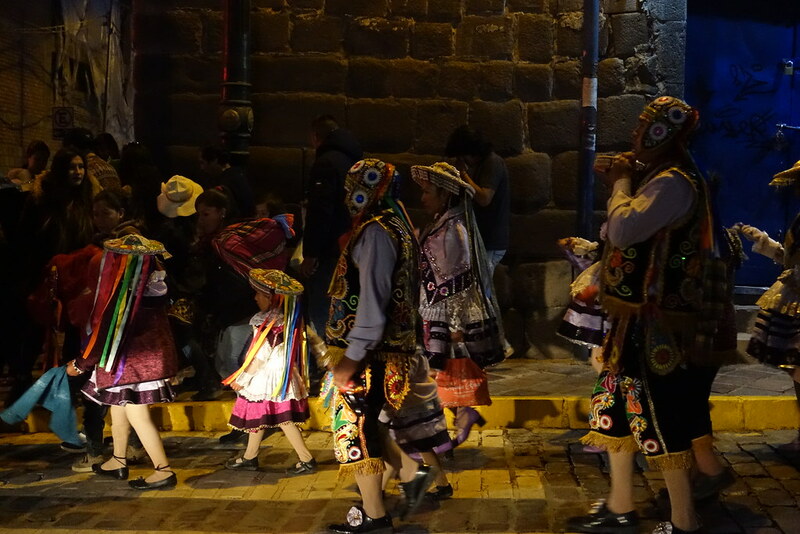 Traffic was bad as a result, and the Collectivo we’d caught from Ollantaytambo stopped outside the centre and left us to find our own way in. 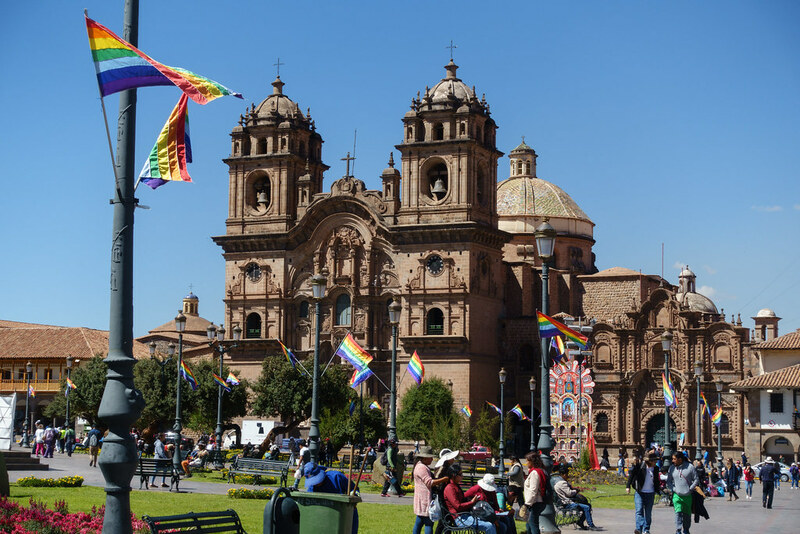 We encountered two colourful street parades and squeezed our way past dense crowds, particularly in San Francisco Plaza which was filled with street stalls and sellers. 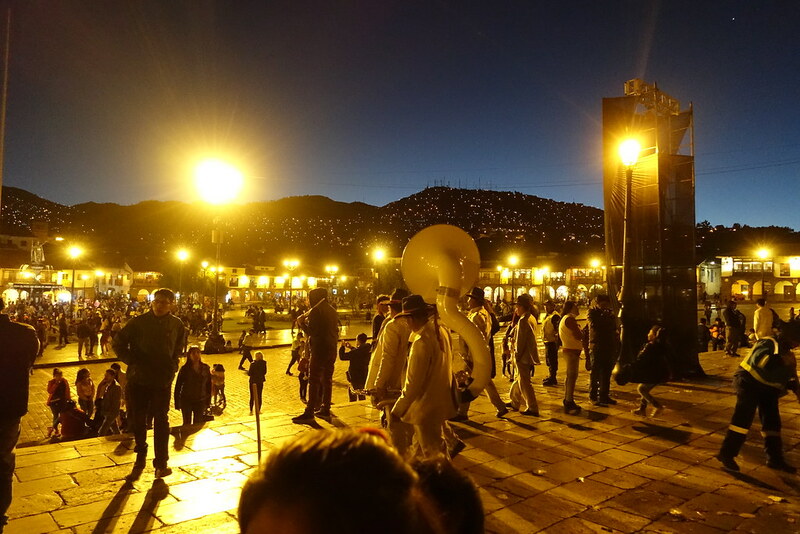 When we eventually reached Plaza de Armas there was a brass band playing in front of the church, and we stopped to watch and listen while the street lights shimmered. 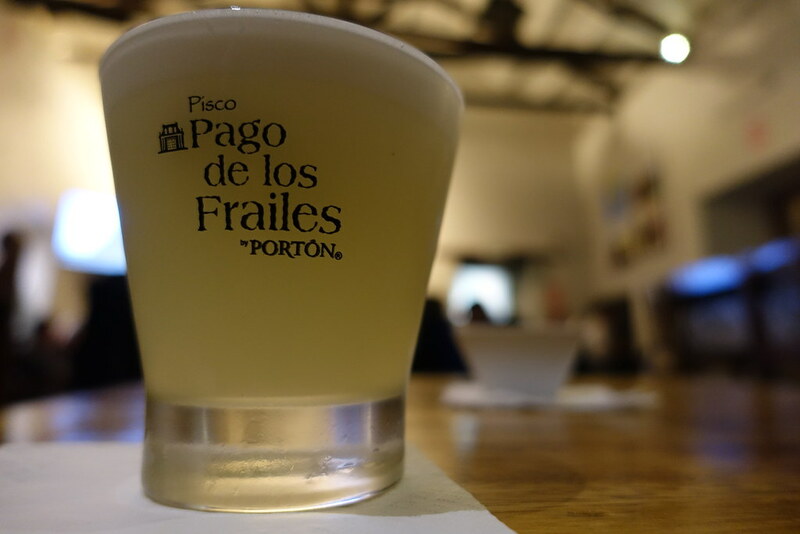 Despite having been in Peru for six days I still hadn’t tried a pisco sour, so we decided to go to the Museo del Pisco bar. The bar wasn’t as informative as the ‘museum’ in its name suggests, however its pisco sour was delicious (as was the fruity pisco cocktail that followed)! 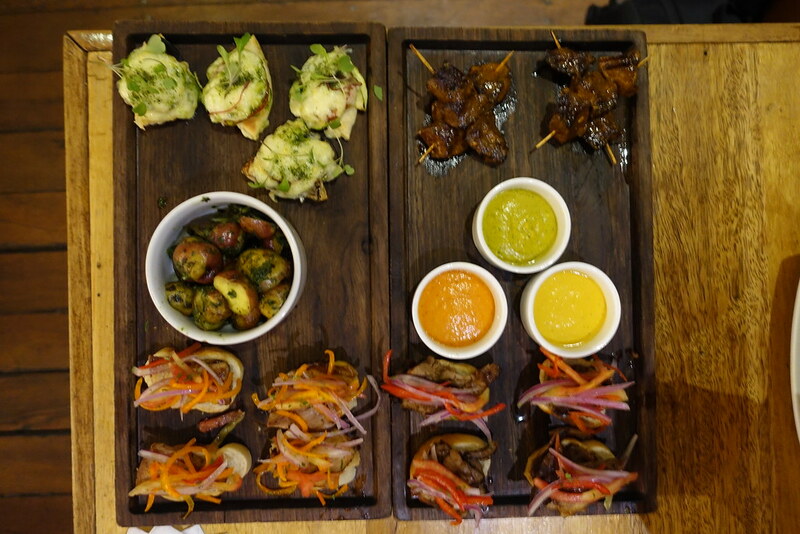 The food was really good too: we got four tapas plus roast potatoes for 70 soles, which included marinated lamb and pork on small chunks of bread, roast vegetables and mozzarella on bread, and juicy beef heart ‘anticuchos’ on skewers. 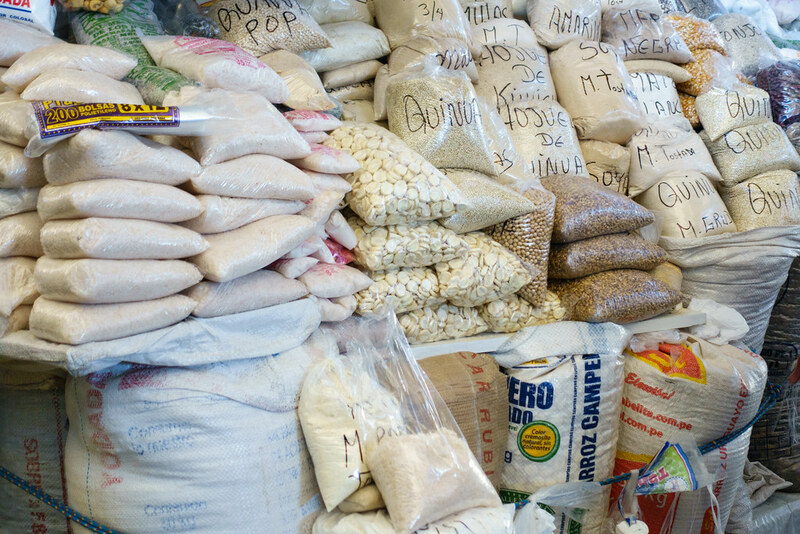 There was a TV screen on the wall continuously playing a video, which we presumed to be showing how pisco is made. There was a particular moment where a camera was attached to a bottle, and it was quite funny seeing the ‘Peep Show pisco’ again and again! We started the next day with a delicious breakfast at Torre Dorada before checking out and leaving our luggage with the hotel. We walked into town the way we had before, this time stopping to look around the churches that we passed (but leaving when we found out you had to pay admission!). 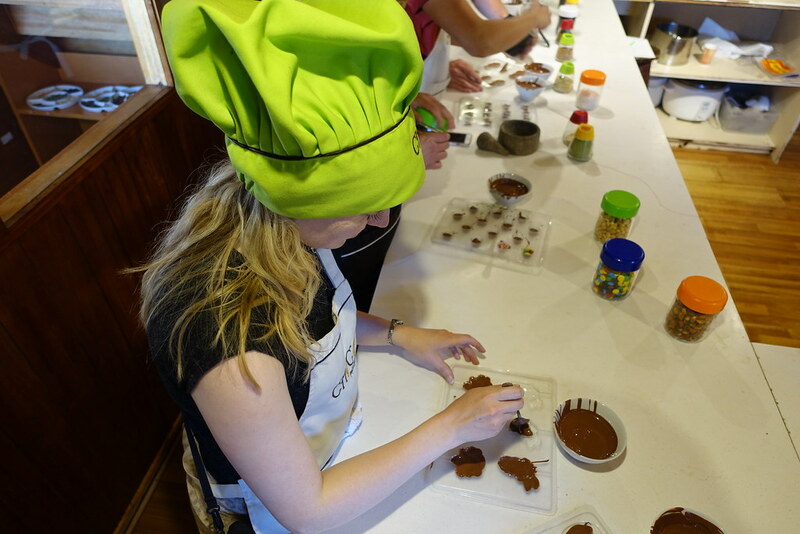 We explored the old district and souvenir shops, and booked a chocolate-making workshop at Choco Museo. 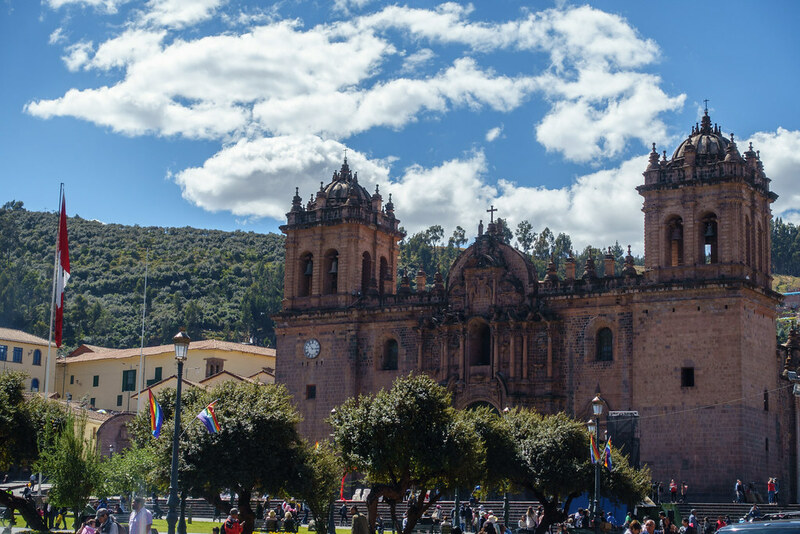 We had an hour and a half before it began, so spent some time relaxing in Plaza Regocijo and eating empanadas from Panam bakery. 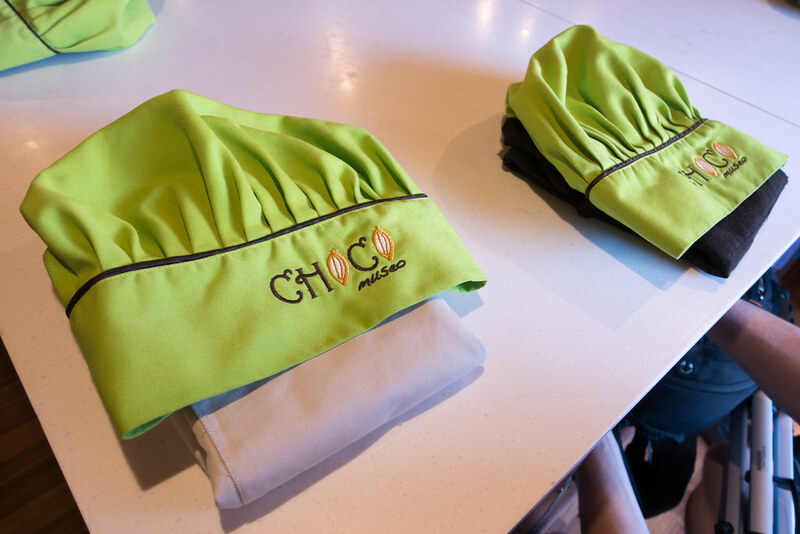 The chocolate-making workshop at Choco Museo was great, from putting on the chef hats to collecting the final product! 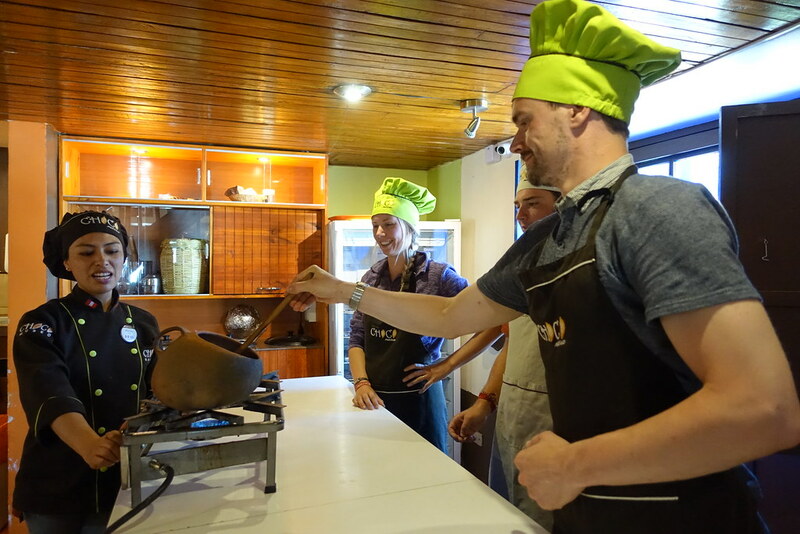 It began with an educational introduction, in which we tasted both cacao beans and the pulp that surrounds them in the cacao pods. 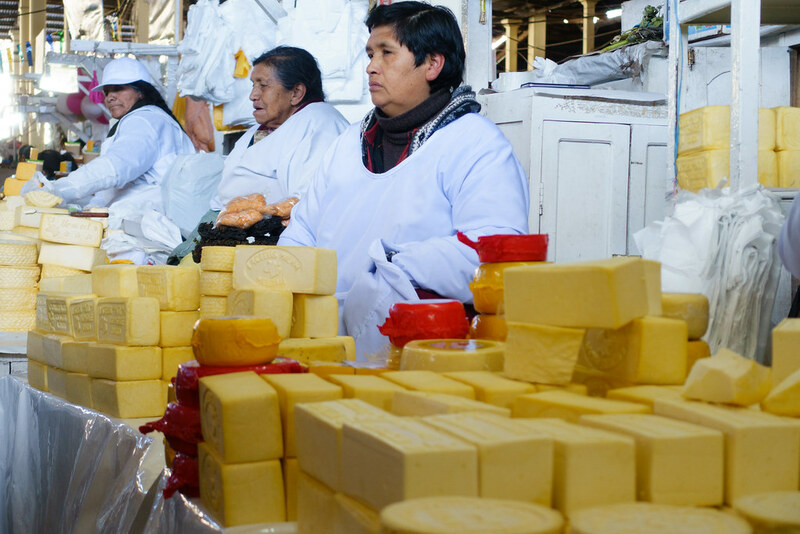 The cacao pulp was like a white, buttery paste with a very subtle flavour somewhere between tropical fruit and white chocolate. We all participated in making ‘Mayan’ hot chocolate with honey and chilli, and milky hot chocolate with cinnamon. Everyone preferred the latter! We picked out our own cacao beans, stirred them while they roasted in a pan, peeled off their shells, and crushed them in a pestle and mortar. The resulting paste was used to mix the hot chocolates, while the shells were used to make chocolate tea. 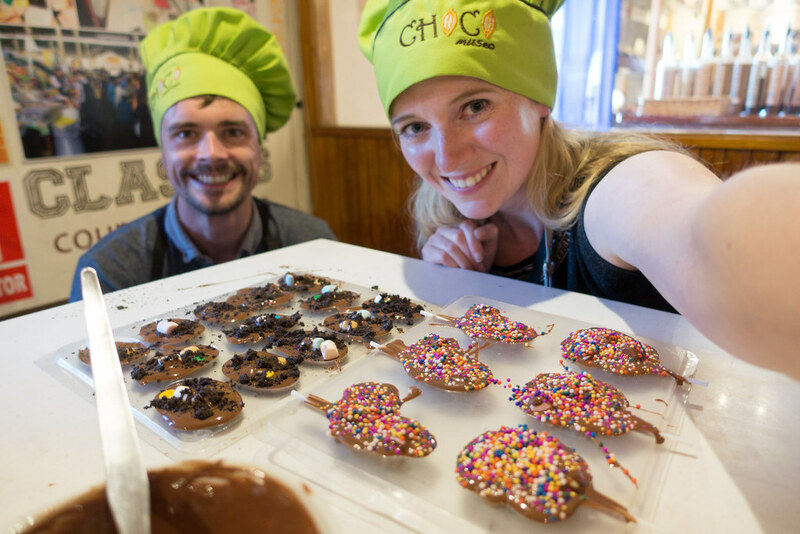 The best part was when we were given warm liquid chocolate, plastic moulds, and a wide variety of toppings with which to make our own chocolates! I was quite pleased with my sprinkle-covered, rose-shaped, marshmallow-filled chocolate lollies. We put them in the fridge to set and were instructed to collect them later that day. 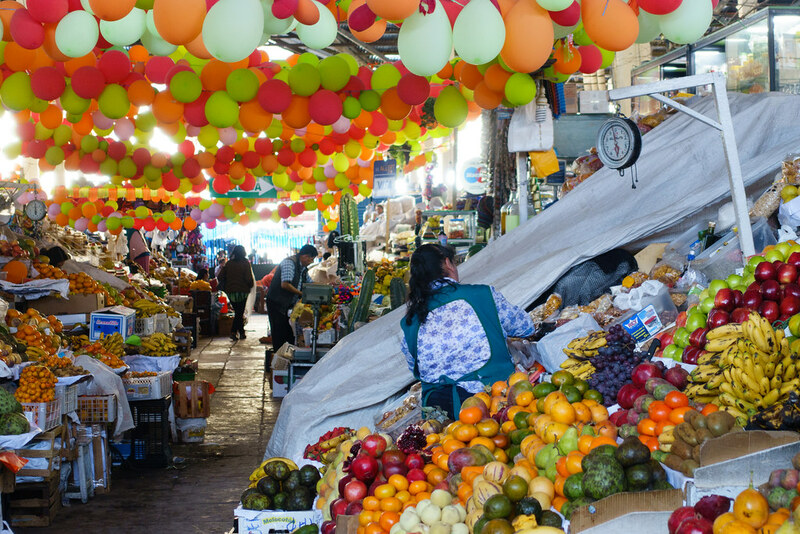 In the meantime, we went to San Pedro market: a sprawling, bustling and extremely varied network of stalls. 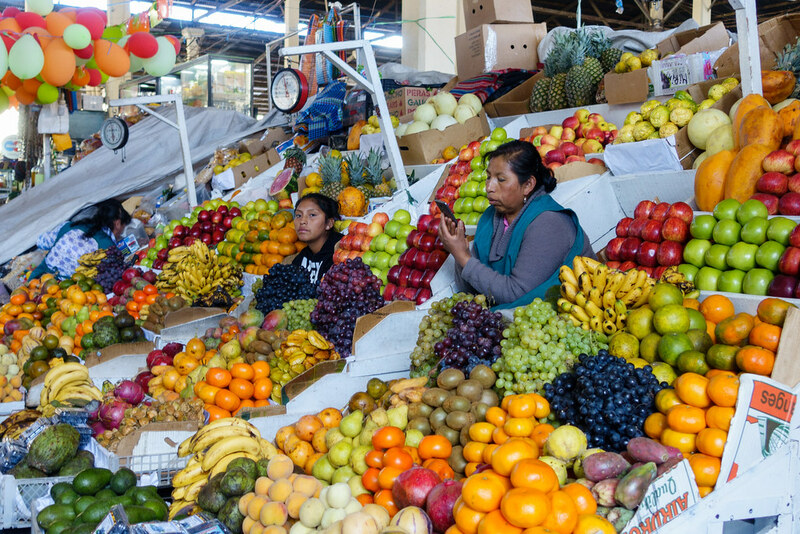 While there are plenty of stalls selling tourist souvenirs, San Pedro’s main customers are clearly locals coming here to buy groceries, clothes and homewares. 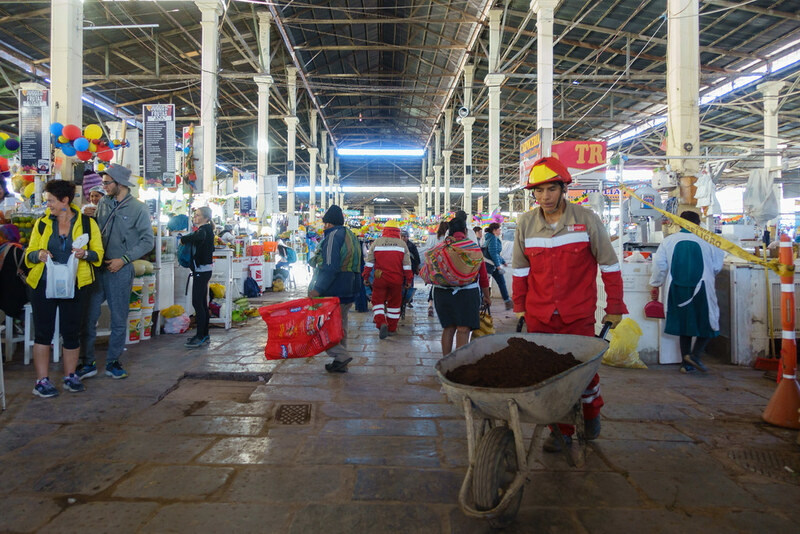 The stalls piled high with colourful fruit, bags of quinoa, and hanging raw meat – construction workers milling about between them, busy fixing holes in the floor – made for an authentic and eye-opening experience. I couldn’t resist doing a bit of shopping myself. I fell in love with and bought a quintessential fluffy llama souvenir (it even had a colourful knitted hat!) and a fantastic set of traditionally decorated tablemats and runner. Having collected our chocolate from Choco Museo, we went to a bar called Nuevo Mundo to have a drink and decide on dinner. 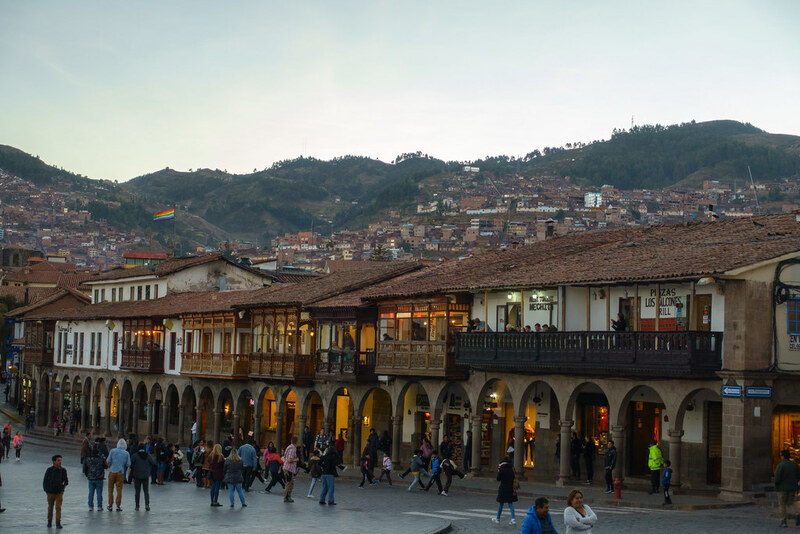 Nuevo Mundo specialises in craft beer and is a cosy, fairy-lit place to hang out, with a good view of the central square from its end window. We decided to eat dinner at Native Burgers Chakruna on the strength of its glowing reviews on TripAdvisor. But the restaurant was so small and busy that we had to wait for a table, and when we did finally get a table the experience was disappointing. While it was certainly cheap (9 soles for a burger, fries and drink), I didn’t think the food was very good. 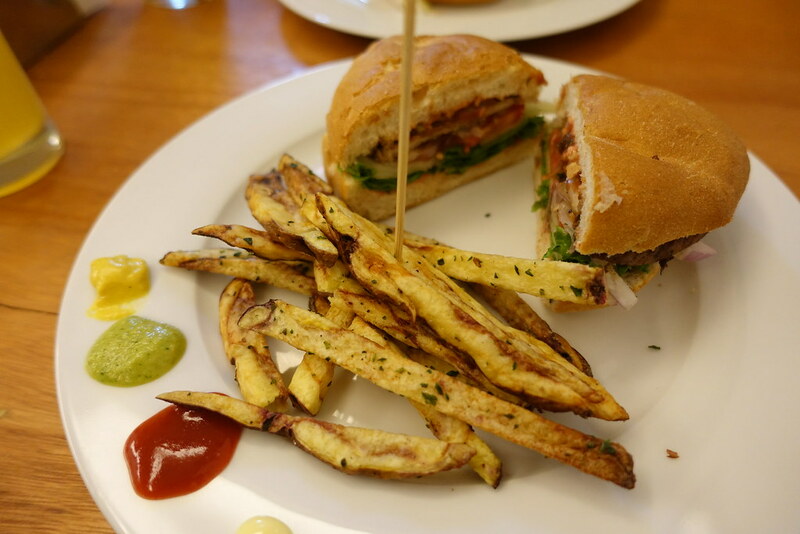 The burgers were very small and basic, and the chips were thin and dry. 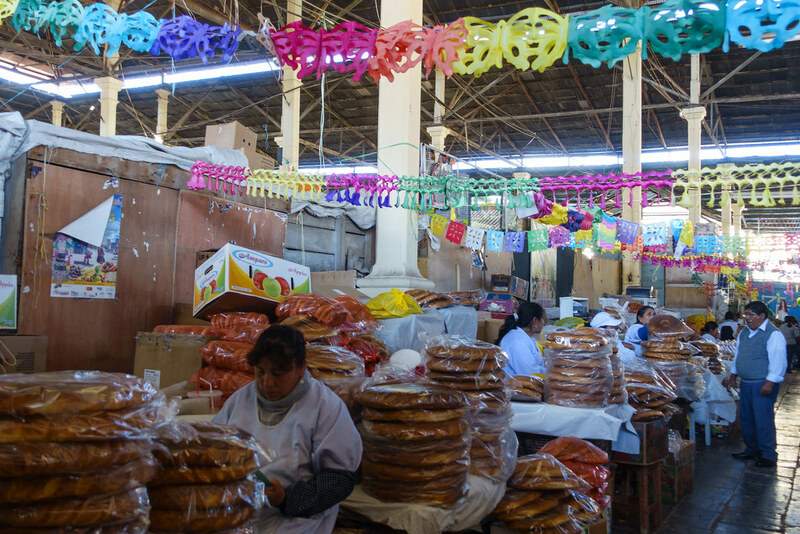 We returned to Torre Dorada to pick up our luggage, then asked the car to take us to the Bolivia Hop bus terminal. We were too early and had to wait for the doors to open, shivering in the street with our luggage. Shortly after being let inside we collected our wristbands, got on the bus, and settled in for the night. 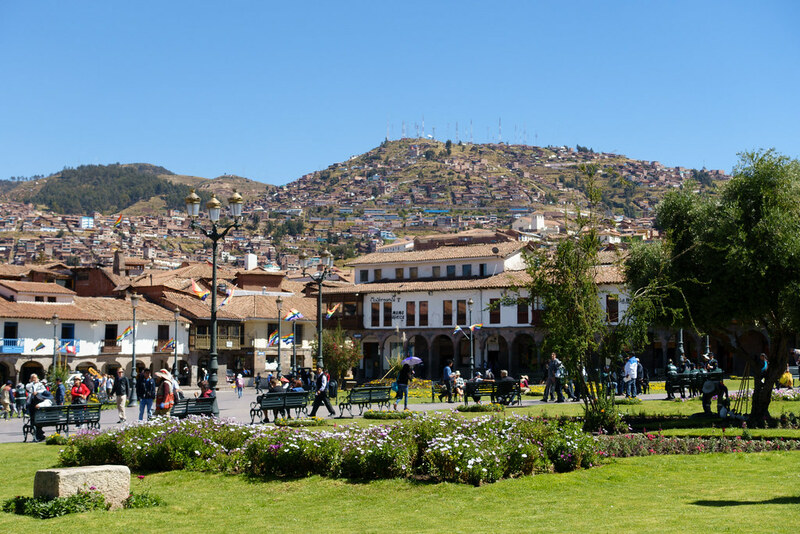 Tomorrow, we’d wake up at Lake Titicaca. Subscribe to this blog or follow Roam with Juliet on Facebook to be notified when the next post goes live. 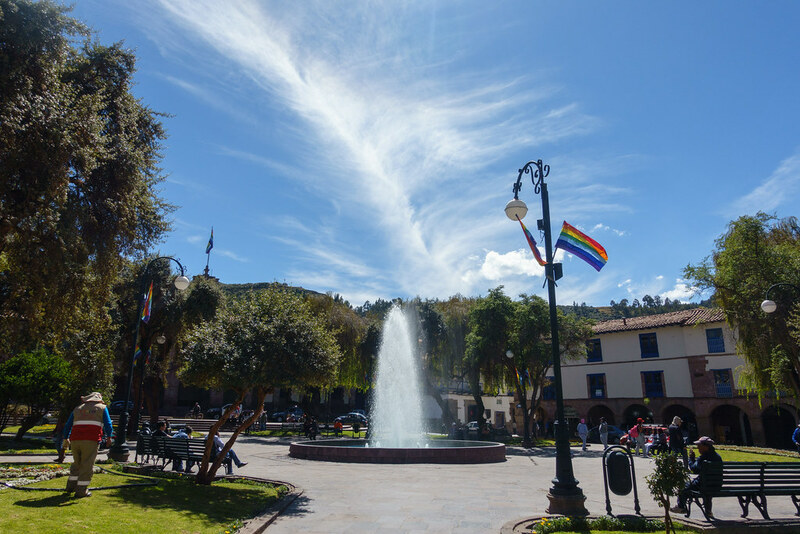 Posted in Peru, Photography, South America, TravelTagged ceviche, Choco Museo, Cusco, Morena, Pisco Museo, San Pedro marketBookmark the permalink.